Tagged under Husbando, K-Pop Idols. 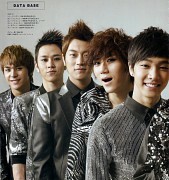 B2ST is a South Korean Boy Band consisting of 6 members under Cube Entertainment. The group members are Yoon Doo Joon (JYP Entertainment trainee / Leader, Vocal, Rapper), Jang Hyun Seung (YG Entertainment traineer, supposedly to debut with Big Bang), Yong Jun Hyung (also known as Poppin' Dragon / used to be a member of XING / Rapper), Yang Yo Seob (JYP Entertainment trainee / Main Vocals), Lee Gi Kwang (JYP Entertainment trainee / debuted as a solo artist under the name AJ), Son Dong Woon (JYP Entertainment trainee). B2ST stands for "Boys to Search for Top".